Latest version: Español, Older versions: 0.15 Français, 0.14: Italian. Available from Prentice Hall as a book or as an ebook. This book has a website with additional material. Go to: http://tavmjong.free.fr/INKSCAPE/. Suggestions and corrections are welcome and can be sent to tavmjong @ free . fr. This book in HTML form is available for personal use only. It may not be reproduced and distributed in any form without the consent of the author. Inkscape, Guide to a Vector Drawing Program is the guide to the Inkscape program. The web-based version is linked directly under the program's Help menu. 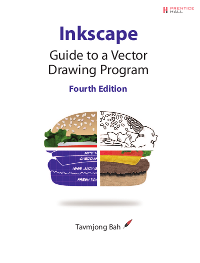 This book is both an introduction and reference for the Inkscape drawing program. With Inkscape, one can produce a wide variety of art, from photo-realistic drawings to organizational charts. Inkscape uses SVG, a powerful vector-based drawing language and W3C web standard, as its native format. SVG drawings can be directly viewed by all the major web browsers including Firefox, Opera, Safari, Chrome and Internet Explorer (starting with version 9). With the advent of HTML5, SVG will be easily embedded in web pages. Inkscape is available free for Windows, Macintosh, and Linux operating systems. The first third of the book is devoted to eight tutorials that progress in difficulty from very basic to very complex (three additional tutorials were written explicitly for the PDF and print versions). The remainder of the book covers each facet of Inkscape in detail. Updated for Inkscape v0.48, the book includes complete coverage of new features including: updated Node tool with multipath editing, new Spray tool, improved Text tool, and many new extensions. Advance topics covered include the use of Inkscape's powerful tiling tool, built-in bitmap tracing, and SVG use on the Web including in HTML5. The book includes plenty of tips (and warnings) about the use of Inkscape and SVG.